I picked this up because it covers some of the backstory of the New 52 version of Black Canary, and was released alongside volumes 2 and 3 of the New 52 Birds of Prey. The first and only volume of Team 7 is set five years in the past relative to them, and chronicles Dinah Drake's membership on the U.S. government special ops team known as Team 7. If you're looking to pick up this volume for backstory on Dinah, what you get here is a mixed bag. On the one hand, I liked the glimpses we get of between Dinah and her boyfriend Kurt Lance, especially in the first couple issues, where they go on a few missions together. They have a fun, playful banter, and the convince as a pair who like to both work and play together. Unfortunately, as the team assembles, the focus goes off their relationship, to the extent that it is revealed in an offhand comment from a teammate that they got married between issues. In fact, the banter between Kurt and Dinah is probably the only good banter Justin Jordan writes. The rest of the dialogue is so generic. An ongoing thread of Birds of Prey has been that Dinah is wanted for the murder of Kurt, which happened three years prior. Here, he dies five years ago in the heat of battle, when the team pours all its energy into Dinah's canary cry, and Kurt is among those killed in the blast. I can see why she would feel guilty, but there's no logical way she could have ended up wanted for murder based on what happened here. Plus, from a storytelling perspective, the death of Kurt just doesn't have the weight it needs to be effective, their relationship being too underdeveloped and the moment itself being too tossed off. 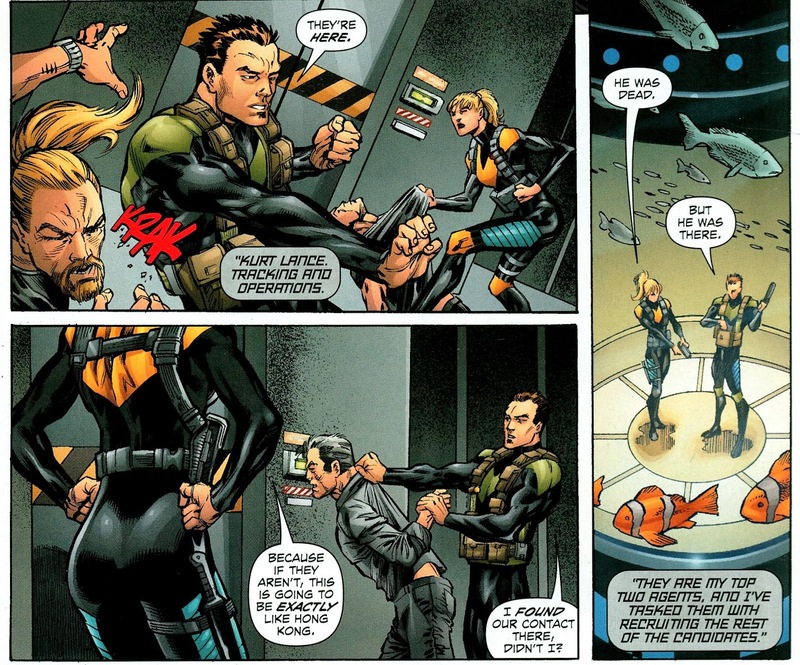 The weird thing is that the person who will try to arrest Dinah for supposedly murdering Kurt (I think, I didn't really follow how that plot in Birds of Prey ended) was standing right next to her when it happened. It seems that Dinah's superpower is being able to touch herself across panel borders. The plotting is weird too. The first story has Team 7 discover a chemical formula based on the work of Dr. Jekyll(!) 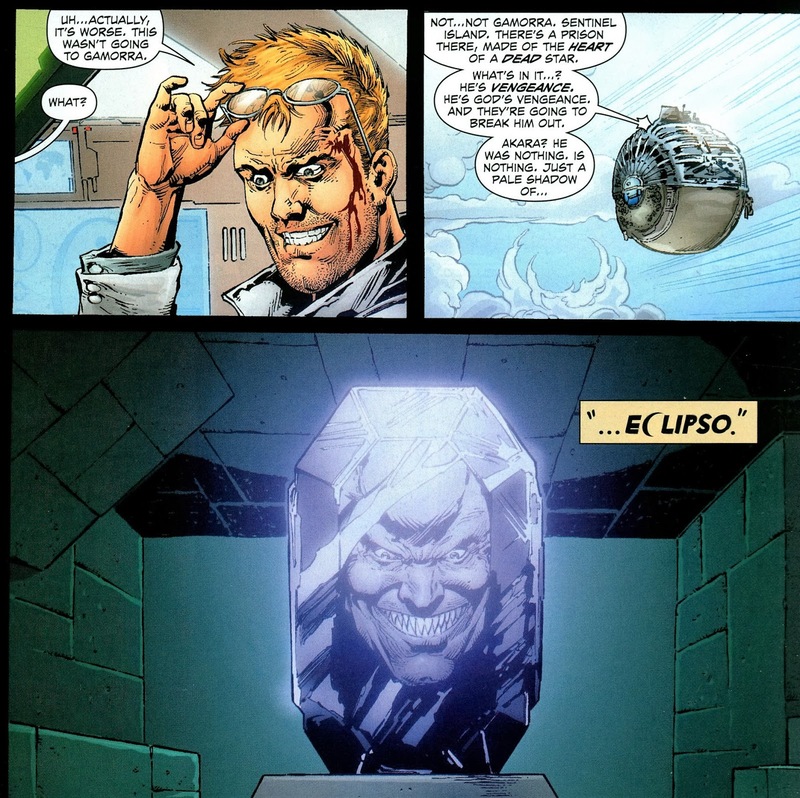 that turns people evil, i.e., into Eclipsos; they fight its victims on a floating prison, only to learn that Eclipso is gathering power on an island where he's imprisoned. How are these modern, science-based Eclipsos connected to the ancient, all-powerful Eclipso trapped inside a jewel? Who knows. Similarly, the jumps in the second storyline, about evil cybernetic organisms and the terrorist island of Gamorra, render it nearly incomprehensible. Like, why did some guy I don't care about suddenly become the superhero Majestic? 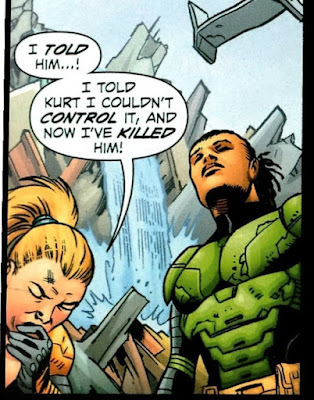 How did Kurt Lance realize he had the power to enhance Dinah's powers? Where did this whole Gamorra thing come from anyway? It's a blur of pointless, baffling action. Say what you will about Eclipso: The Darkness Within, but at least they're not reviving Bloodlines. Ultimately, this book has little to recommend itself beyond being a confusing piece in the puzzle of DC continuity; as a standalone tale, there's nothing in the storytelling or the characters to make it worth reading. Stepping back for a second, can I say that I don't really care for what the New 52 did to Dinah? I understand why the legacy backstory of the post-Crisis universe may have been more complicated than was wanted for the streamlined New 52, but just making her into an ex-government agent is uninteresting and too like too many other New 52 DC characters. If nothing else, I would have liked to have seen the original Dinah Drake, black-haired florist by day, blond crimefighter by night, flirting with hapless detective Larry Lance, reinstated: it's fun and unique. (Why was Lance's name changed, anyway?) I don't mind revising continuity, but if you're going to nix an old backstory, you'd better have something at least just as interesting to replace it. What was done with Black Canary later in the New 52, making her into a crimefighting band leader (and giving her a much more stylish visual appearance) succeeds where the Team 7 reboot did not, even though it is also entirely different from what went before. Next Week: Back to the present day to follow up on the repercussions of these events, as the Birds of Prey experience A Clash of Daggers!